The Facing Out conference day two took quite a different format to the more hands-on day one. Today was more focused on conversation and discussion, with presentations that very much embraced the interdisciplinary nature of the project and hoped to explore, in a stimulating, inclusive and creative way, some of the challenges of living with an altered appearance and how they may be recognised, addressed and overcome. The delegates were an interesting and dynamic group, including people from a medical background; music therapists, artists and arts for health practitioners; representatives from Changing Faces - the national charity for people with a disfigurement- along with people who have experienced what it is like to live with a facial difference. All had a great deal to bring to the conversations! The day began with my own presentation which was an overview of my art practice and how it developed to included arts for health activities. I also talked about the themes of my work and how they have fed into my thoughts when approaching the Facing Out project. I introduced the group to my thoughts about the gaze, both the artist's gaze when painting an individual, and also the gaze experienced by people who live with a facial disfigurement. I hope that by being painted, depicted with a strong outward gaze, the 'Facing Out' portraiture subjects might be in a position to encourage others to consider the individual beyond the roles of 'one who is disfigured' or 'cancer patient' and see more of the person as a whole and take away a deeper sense of empathy and understanding. The second presentation was as much a revelation to me as it was to the rest of the group. I met Mr Partha Vaiude when he was taking part in Eleanor Crook's anatomical sculpture workshop that became Day One of this conference. At this first meeting, I was really impressed by his contribution to the group, his insights into anatomy as it relates to plastic surgery, and the very fact that he was there, willing to recognise that interaction with an artist might inform his own practice. He obviously wasn't conforming to the stereotypes that often surround surgeons as arrogant or imperious! My ears really pricked up when he mentioned that he was the first member of his family for five generations not to have followed art as a career. What a heritage and what a fascinating position from which to embark on a career in plastic surgery! I was interested to hear about what Partha considered to be the crossovers between art and surgical practice and was delighted when he agreed to come and speak. The presentation that Partha delivered went way beyond expectations, spanning the history of art and surgery, describing the birth of plastic surgery in ancient India as described and illustrated in the Sushruta Samhita, going on to look at perceptions of beauty and exploring Partha's thoughtful reflections on his own practice as it relates to his artwork. Partha called on us to consider facial plastic surgery at it's essence as an exercise in balancing of light, shape and form and in doing so we were given an insight into surgery as an artform. We were very pleased to welcome Professor Diana Harcourt from the Centre for Appearance Research at the University of the West of England to speak. The centre is the world’s largest research group focusing on the role of appearance and body image in people’s lives. Diana is interested in the psycho-social impact of an altered appearance or visible difference, offering support for those who are affected and interventions to help people who are making decisions about surgical treatment that will alter their appearance. The presentation that Diana gave was as interesting as it was informative. Drawing on the centre's research findings, Diana recognised and described some of the challenges that people with a disfigurement meet in their day to day lives and when coming to terms with an altered appearance. She then went on to outline strategies that might be employed by those affected to build resilience, confront specific challenges and live well with an altered appearance. It was fantastic to have Diana with us and have an opportunity to hear about some of the excellent work that is being undertaken at the Centre for Appearance Research, and, through engaging with her presentation and chatting over lunch and in the group discussions, acknowledge the very particular challenges that are faced by some of our conference delegates on a daily basis. The lunchtime break saw the group moving into the gallery's learning studio and while the buffet was eaten, delegates had the opportunity to chat with Liz Gill, Research Fellow/Reconstructive Scientist at MMU. Liz showed us a display of 3D printed prosthesis and talked about the future of reconstructive surgery in the age of the digital scanner and 3D printer. Chris Ball came along from MadLab to demonstrate just how this equipment works. He brought with him a 3D printer and digital scanner and delegates were able to be scanned and have a mini facsimile of their head printed out! After lunch, we kicked off with a reading by Graeme Heward from his book, 'Riding With The Alien' in which he tells the story of his experience of facial cancer and living with an altered appearance. Graeme's book gives an intimate insight into the particular challenges faced by people in his situation and was an invaluable read when embarking on the Facing Out project. It was great to hear Graeme read from the book and his generous openness opened the door for other participants to speak freely about their own stories. Thanks Graeme. Next up was a very interesting presentation from Dr Anne Marie Martindale who has been on board with Facing Out from the very beginning and whose input has helped to shape the direction that the project has taken. Anne-Marie is a health anthropologist, experienced researcher, and lecturer at the University of Manchester. 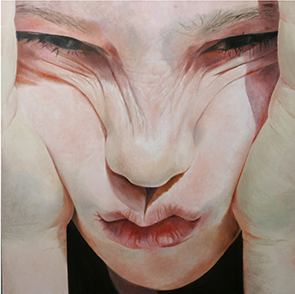 Her PhD explored the relationship between faces, acquired disfigurement and identity. The presentation gave an overview of her research into the relationship between faces, acquired ‘disfigurement’ and identity. The first part explored the cultural life of faces over the last two thousand years drawing on a range of influences including Ancient Greece and James Bond. Anne Marie questioned the cultural tropes that place disfigured people in the role of 'villain' and the hackneyed device that describes the physically disfigured as morally corrupt, although the 'right' sort of scarring (away from the features, on a cheek perhaps) can also be used as a short-hand to signify heroism. The second section explored key findings from her 13 in-depth interviews with facially disfigured people from all across England. She focused on their stories and experiences of life, ‘disfigurement’ and identity. It was particularly interesting to listen to Anne Marie's stories drawn from interviews and relate them to some of Professor Harcourt's insights from earlier in the day. I was particularly struck by the anecdotes that Anne Marie shared that gave life to the Professor Harcourt's understanding that the intensity of the disfigurement doesn't always relate to the impact on the individual. Her presentation vividly illustrated that to some people a relatively small scar can be more detrimental to their mental health than a much more extreme facial difference as experienced by another individual. Anne Marie's presentation led into a round table discussion, with the delegates splitting into four groups each with a question to address. The discussion topics were captured on paper and were fed back to the wider group. 1 How would you describe/define the relationship between faces and identity? 2 Does facial ‘disfigurement’ influence a person sense of who they are? 3 What do you think are the pitfalls and opportunities becoming a portraiture subject as someone who has an altered appearance? 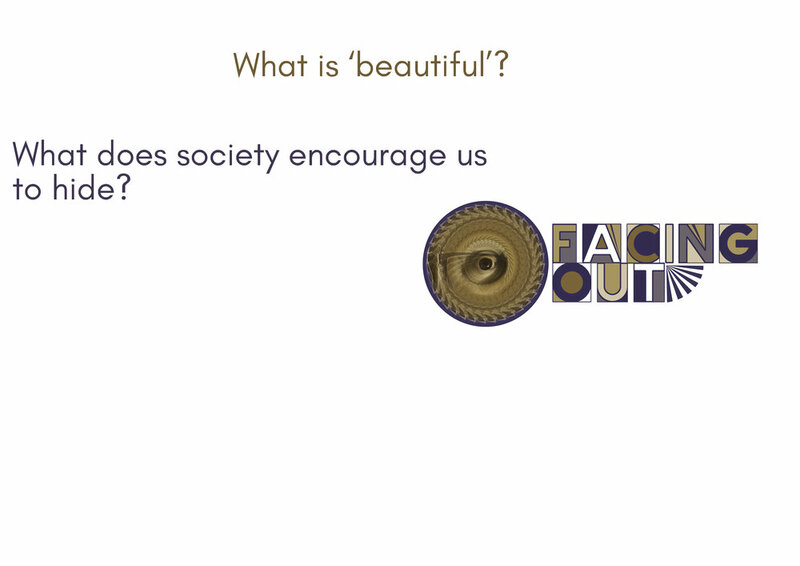 4 Do you think that engaging with arts and craft activities can help people who have experienced facial ‘disfigurement’? How do you think that might work? Discussion about how art may help with the acceptance of an altered identity led us into the more practical elements of the day's activities as the group were taken on a dedicated tour around The Whitworth's current exhibitions with special focus given to artworks that explored aspects of identity. The tour allowed the group to chat about the artworks informally as well as gain a deeper understanding of selected pieces hearing from the tour-guide about the intention of the artist, along with the narrative elements of the images and the artistic techniques used in creating them. We returned to our room thoroughly inspired and ready to embark creating on our own art! Wendy Gallagher, Arts for Health Partnership Manager at The Whitworth and Manchester Museum, introduced the session, giving an overview of the galleries' outreach programme that specifically targets hospital patients and people living with illness. We watched a short film about 'Culture Shots' one of The Whitworth's initiatives that takes art and culture into hospitals. Illustrator Daisy Strang then led a practical portraiture session which proved to us all that the fun and frolics that can be had when making art together are much more important the the finished work! It was arts for health in action and it sent us away from the Facing Out conference with smiles on our faces. I would like to thank everyone who was involved in the day, both presenting and participating. I think it is safe to say that the day was a great success which brought together a wide variety of people and led to the sharing of personal stories, academic research and arts for health approaches. Please continue to follow Facing Out, I do hope that we can meet up again and continue the conversation when the exhibition launches in 2019!